The CES-A1 is a set of sealing cover and earpiece specifically made for the Stax SR-003MK2 and SRS-002 in-ear-monitors. The set has been developed in order to provide sealing to minimize sound leakage and to improve wear comfort for extended use. A lot of innovations are incorporated into the sealing cover CC-A1 to bring full potential of SR-003MK2 and SR-002 into play. Visitors at the event hall listened to the sealing cover effect, and their opinions have been reflected in refining the cover. After repeated measurements and auditions as well as dozens of trial productions the sound leakage has been suppressed enabling listening to music in the outdoors without spoiling the tone quality of electrostatic type sound element. An asymmetrical layout has been employed for the cover structure. By daring to shift the center axis, the sound diffusion is adjusted and the generation of standing wave is prevented. Thus both high resolution and clear sound image has been realized. The rib mounted inside the cover reinforces rigidity and controls unnecessary resonance. The sound-absorbing material equipped inside the cover aims at controlling reverberation sound. The sound absorption space absorbs sound using the internal material and then mutes sound when it passes through the opening, which is effective in suppressing the interference to the film diaphragm. The ear chip ET-A1 provides with different elastic hardness each for ear hole touching portion and for ear pinna touching portion. This has improved the fit feeling and close contact. 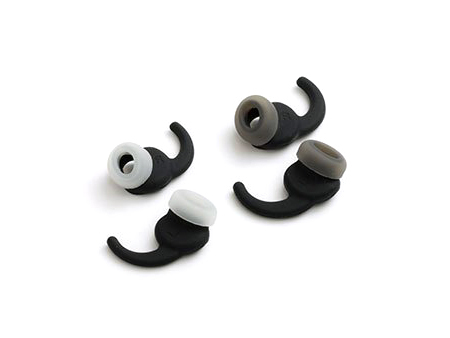 Moreover, the opening has been made elliptical to fit in common with many ear holes, and also improving contact tightness of outside ear passageway has controlled the loss of low-frequency region.